Mexico, USA: Who Will Pay the Price for Wal-Mart’s Corruption? 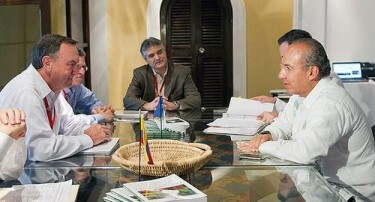 President Calderon (right) met with Walmart CEO Michael T. Duke in Cartagena, Colombia in April 2012 and his office issued a statement and this photo. There have been better times to be associated with Wal-Mart. 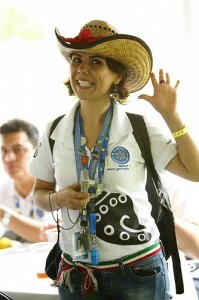 In 2011, for example, it was named in the top 10 most transparent corporations in Mexico [ES]. Yet one of the world’s largest corporations is taking a hit after evidence surfaced that their Mexican subsidiary paid US$24 million in bribes to Mexican officials between 2002 and 2005. According to an investigation by the New York Times, Wal-Mart has kept this information quiet since 2005, when a former employee in Mexico blew the whistle. Taking every opportunity to call out bad practices at the company, Wal-Mart reform advocacy and employee groups jumped on the scandal, calling on Wal-Mart’s CEO to resign in an online petition started by Organization United for Respect at Wal-Mart (Our Wal-Mart) on Change.org. At that meeting, Calderon “congratulated Wal-Mart on its commitment to the environment by generating increasing amounts of clean energy” and praised the company for buying directly from Mexican farmers, his office said. Duke, for his part, declared that “Mexico is an example for the rest of the chain worldwide” according to the statement. Johnson writes that the president’s office issued a “bulletin” on April 23 that attempted to distance the federal government from the scandal by emphasizing that the bribery by was to local and state functionaries. Calderon didn’t become president until after the alleged bribery took place. One thing not well explained in foreign coverage of the Wal-Mart scandal is that Wal-Mart de México S.A.B. de C.V. consists of several smaller chains of supermarkets like Bodega Aurrerá and Superama, clothing shops like Suburbia, and VIPS restaurants. It has been argued that while some of these existing chains were fairly acquired others were subject to more hostile takeovers. Marco Antonio Gómez Lovera on Vivir Mexico [ES] is incensed that Wal-Mart executives in the United States and Mexico preferred to hide their knowledge of the bribery rather than investigate further and punish those responsible. Meanwhile, Mexfiles and other blogs [ES] opined that U.S. media and authorities may be downplaying the Mexican reaction due to a supposed “culture of bribery”. Transparency International Bribe Payers Index, from Transparency International, Berlin, Germany. Examining the Links Between Organized Crime and Corruption, from the Center for the Study of Democracy (CSD), Sofia, Bulgaria. Global Anti-Corruption Efforts: The role of Non-Governmental Organizations, from the Centre for Applied Studies in International Negotiations (CASIN).